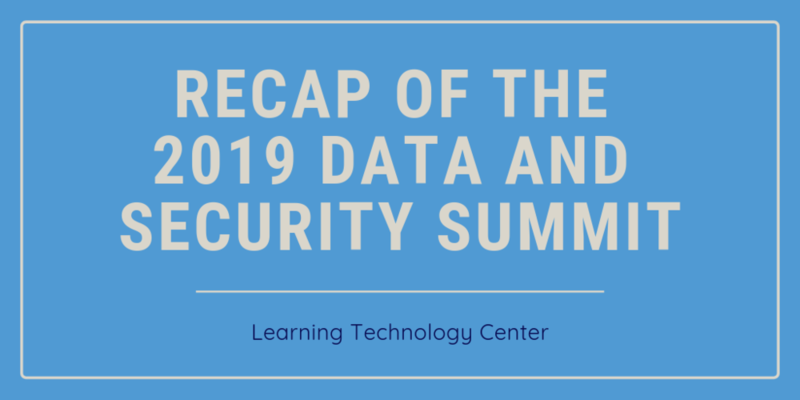 The Learning Technology Center hosted their second annual K12 Data and Security Summit on January 16 in Tinley Park and January 17 in Effingham. Over 190 administrators and technology leaders came together to learn about current legal requirements related to student data, best practices for data privacy, and strategies for securing data in the educational environment. Doug Levin, the CEO and Founder of EdTech Strategies, kicked off the event by sharing his efforts to track and visualize the cybersecurity-related incidents occurring in K-12 public schools and districts. Doug has documented over 400 publicly shared phishing attacks, unauthorized disclosures, breaches or hacks, ransomware attacks, denial-of-service attacks, and other cyber incidents resulting in school disruptions and unauthorized disclosures. Breakout sessions and whole group conversations throughout the day were facilitated by Ross Lemke, the Director of the U.S. Department of Education’s Privacy and Technical Assistance Center; Chris Hill, the Chief Information Security Officer for the Illinois Department of Innovation and Technology; and Chris Wherley, the Learning Technology Center’s Network and Technology Services Coordinator. Common themes in all sessions emphasized that school districts are vulnerable, communication and planning are essential, and security is a shared responsibility between all district leaders and not just the technology staff. More information, including resources and presentations from the event, are available on the LTC Data and Security Resource Center.